A few weeks back, "Weird Al" Yankovic released a couple of Blu-ray discs: Alpocalypse HD and "Weird Al" Yankovic Live! The Alpocalypse Tour. Anyway... Alpocalypse HD is basically just the videos from his recent album, in HD. The only bonus material are three videos from his previous album (Straight Outta Lynwood) which were made too late to be included on that CD/DVD combo disc: White & Nerdy, Do I Creep You Out and Trapped In The Drive-Thru. The videos (which I reviewed along with the album) are pretty good, although a little hit-and-miss. It's his first time making videos for every single song on an album - most of them are animated, and most of those are animated pretty cheaply by the looks of them. But you can't really expect high-budget productions for that many songs. The lack of 5.1 mixes is disappointing. Because the album has been out awhile and all of the videos have been online at some point, there's really not much here to recommend. But if you haven't seen his videos yet, or are a completist "Weird Al" fan and want to make sure you have every single one of his videos, it might be worth the $17. Shown in part on Comedy Central, "Weird Al" Live! was recorded earlier this year, so it features his most recent concert tour and material. It's a mixed bag for me though, because while he puts on a good show, all of the interstitial clips shown during the actual concerts from his movie UHF or various AL TV episodes have been left out. During the show, these are used to bide time while costume changes are done backstage, so maybe that wouldn't work so well on home video, but it would have been nice to have the option to play them. The bigger issue I have is that there are songs during the show that are so heavily produced, they rely pretty heavily on pre-recorded backing tracks (instrumental and vocal). While most of the music is performed live, I really detest the idea of using pre-recorded anything during a live show. To me, it feels more like the kind of performance you'd get on a talk show, rather than a proper, live venue. The songs tend to lack vibrancy and spontaneity when they're over-produced like that. However, later in the concert, Al and the band start ripping through a medley of some of his older songs, with Al on accordion, and the show comes alive. Now generally, I also hate medleys. Play the whole song - or leave it out! But in this case, suddenly the wacky guy with the accordion is back. Not the big Grammy-winning music celebrity, but the guy who used to send in tapes to Dr. Demento. The band and Al absolutely shine during these moments, and I'd love to see a whole show where they stripped everything back, ditched the samples and backing tracks, and just played pure, LIVE music. Al has an amazing band when they're allowed to cut loose. The finale is especially excellent, and must be a tremendous amount of fun to see live (I haven't seen Al live since the mid-90's). Bonus material-wise, there are a few extra live songs which for some reason aren't included with the rest of the concert, but were clearly filmed at the same time. It would have been nice for them to have been played with the rest of the concert, but it's still great to have them. They're some of the best performances on the disc. There are also some of Al's YouTube videos in there, but nothing all that compelling. No behind-the-scenes stuff, which is too bad. I'd really like to see what goes on backstage to make one of his shows happen. While I liked the concert video overall, I just couldn't shake one thing that struck me as odd - his parodies of dead people. It was just a little... morbid watching him still making fun of Nirvana and Michael Jackson. Especially because his Nirvana parody was about Nirvana. So he's dressing up as Kurt Cobain, and running around imitating him, and it's a little creepy. Now this doesn't bother me watching Al's videos of those songs, because they were of their time. But maybe he should consider retiring those songs from his live shows. Even though they were big hits for him, and I don't particularly have any great admiration for Nirvana or Michael Jackson, it just seems kind of inappropriate now for a guy this far along in his career dragging out ghosts of people who died, by all accounts, tragic deaths. He's got enough other material to be able to move on. Anyway, that's a minor quibble, and maybe nobody else will take notice. It's a good show, and I think that it's worth getting the disc, especially if you've never seen him live, or hadn't bought the previous DVD (which I also recommend). I wanted to give shout-outs to a couple of other favorite parody artists. First up - Dread Zeppelin. All you really need to know is how they describe themselves: "Led Zeppelin inna Reggae Style". Well, maybe not all that you need to know. They're fronted by a Vegas-era Elvis impersonator named Tortelvis. I first picked up one of their CDs in '96, when they released The Fun Sessions. 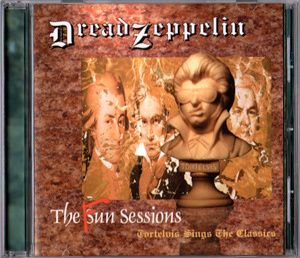 While the band started out doing almost exclusively Led Zeppelin covers, The Fun Sessions was a collection of other rock classics done inna reggae style. With, of course, an Elvis impersonator singing lead. The Who, Lynyrd Skynrd, The Doors, Cream and others got the Dread Zep treatment, and it's all great fun to listen to. ("Freebird" may be my favorite track, just because some of its pomposity gets deflated a bit. ) Tortelvis is actually quite a good singer, too. The band is also really good. Weird, but good. They've released quite a few other albums, but I don't have them all. A little goes a long way. However, I'd recommend starting with Un-Led-Ed, since that was their first. Then 5,000,000*, Hot & Spicy Beanburger, and No Quarter Pounder. They're all fun to listen to, and have sort of their own weird little world they exist in. Pass me my water 'n' towels, Charlie. No, not that Big Daddy. And no, not that one, either. 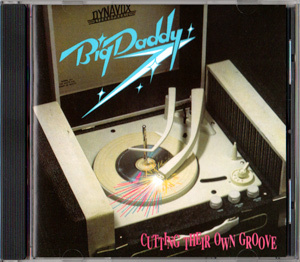 Big Daddy was a group in the early 90's that re-recorded newer rock hits in the style of 50's doo-wop. The first album I had by them was a complete re-recording of Sgt. Pepper's, as if it had been done 10 years earlier. It's really amazing. They nail the styles just right, and also manage to very cleverly juxtapose songs from the 50's with their 60's counterparts. For example, "Within You Without You" is done as beat poetry. Recently, I picked up Cutting Their Own Groove. This was a collection of 90's hits, done in 50's style. From Talking Heads to Madonna, Bruce Springsteen to Guns 'n' Roses - pretty much nothing escapes their musical re-imaginings. And again, the pairings are brilliant. Setting "Welcome to the Jungle" to the tune of "The Lion Sleeps Tonight" made me laugh out loud. "Money For Nothing" was sent up to the tune of "16 Tons". Well worth tracking down this CD if you can find it. Sadly, some of their stuff never made it off vinyl, and CDs can be hard to find. Guess I'll have to do some more hunting. Ya know... I might actually watch the Super Bowl if they did this. Here's a really good interview with Al and the band regarding "Smells Like Nirvana" (which I'd mentioned in the review above). He's releasing eight new videos (one per day) to kick off his new album. I'll review it at some point. Yeah, found that out last night. Wasn't too sure about the Foils one when he started in on the illuminati and all, but it paid off well at the end.